So, you've just about completed your restoration and you're down to the last few details. Typically, the last thing you need is the battery to get you started on your way so to speak. Since original batteries are all but gone and those that are left are so expensive that no reasonable being would even consider actually using one to start a car with, you've probably decided to use a reproduction battery. The reproduction batteries are a pretty close facsimile to the real thing too except for one thing, the date code. 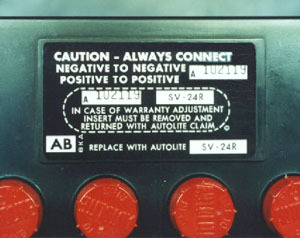 Unless you own a January built 1969 car, the date code found on the reproduction batteries isn't going to match your car. And if you're like me and you've gone to a lot of trouble to make sure that the date codes on your car are appropriate to your car's vintage, this is going to bug you. Fortunately, with a little ingenuity, and simple tools that can be found in the pocket of your average engineer, you can create a new label for your battery that is properly encoded. 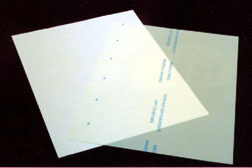 The first thing you need is some laser-label paper and "sticky-back" clear plastic designed for laser printers. You can find this at any of the office supply stores like Office Max or Staples, or if you tend to do these projects late at night as I do, Kinko's has them and they sell individual sheets. Once you have the paper, download the scan of the battery label that I have conveniently provided for you and load the image into your graphics program. You can then use a little digital artistry to rearrange the date code. The date code is in the format Year-Month-Inspector code. You need to change the date code on the label to match the build date of your car. The battery date code should be the same year/month of your car unless it was built at the beginning of the month. In that case, just use the previous month. I have provided some approximations of the original fonts used. These are based on some guesswork though so feel free to do your own research and artistry. Once you have the changes made, I suggest you create a larger image and paste several copies of the battery label. You can fit up to eight copies on a single page as shown here. This allows for some practice and the inevitable slip-ups that will happen when you go to create the label. Once you have the page created, you need to print it out on the laser-label paper. The scan I've provided is at 300 dpi so you need to make sure your printer is set accordingly. I strongly suggest you use a laser printer. Even the best inkjet type printer won't give you the results that even a so-so laser printer will give you. If you don't have access to one, take your image file back down to Kinko's and have them print it out for you. Here's where that "sticky-back" stuff comes in. Cut out one of the labels and a similarly sized piece of the plastic, peel off the backing and apply it over your label as shown here. That little trick will give your label a near identical look to the original one used on the battery. 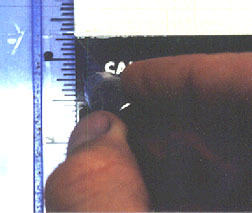 Then, using a straight-edge and an X-Acto knife, trim the edges of the label. Place the straight-edge on the outside to avoid indentations in the plastic. 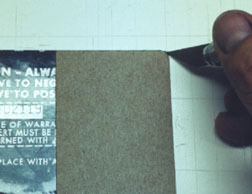 To round off the edges, make a template out of a piece of stiff cardboard or plastic. Using the original label on your battery as a guide, find something with a similar radius and use it as a guide for your X-Acto. One of those Bic pens with the plastic end cap removed stood on end works well. 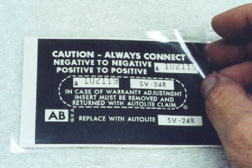 Next, you need to reproduce the die-cut look of the removable warranty insert. It so happens, that a US penny is exactly the right diameter. To again avoid indentations in the plastic from holding down a guide for your knife, cut out another piece of 2 7/8" x 3/4" cardboard and use the penny to get the rounded ends. Then, place the cardboard on the label and trace around it with your knife. Finally, remove the old label from your battery, peel the backing off of your newly created label, and apply it to the battery. As shown here, this relatively simple procedure can give you strikingly good results. This method can also be used to create other similar labels. 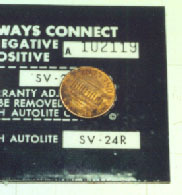 Most notably the small labels found on various wiring looms.